Grado launches Heritage Series with GH1 headphones | What Hi-Fi? 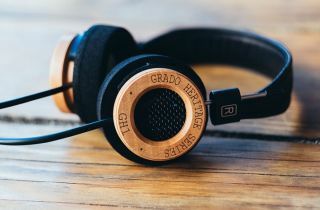 Grado has been hand-making headphones at its New York HQ for over 60 years, and the limited edition GH1 headphones are the first to be made from a Brooklyn maple tree. Grado headphones are arguably known as much for their distinctive looks as for their class-leading sound. The wooden design of some models, such as the RS2 and GS1000i, only serve to ensure a double take from the uninitiated. And now there's an extra special pair of wooden Grados. With the limited edition GH1 headphones, the company has achieved a first: they're the first Grados to be built from a Brooklyn tree. And it's a maple tree from Sunset Park, Brooklyn, no less - the hometown of the Grado family. It's the first time Grado has used maple wood, and the company claims the sound from the open-back headphones is dynamic, with an authoritative bass and accurate midrange and treble frequencies. And with the likes of the award-winning SR325e and five-star SR125e fresh in the memory, we certainly wouldn't bet against another great-sounding pair of Grado cans. The GH1s are the first in the company's Heritage Series and are rolling out to select Grado dealers around the world over the next few weeks. You can see more pictures of the GH1 manufacturing process on the Grado blog.